You probably were looking through the Gintama side-stories one day, noticed "Gintama x KFC" and were left with utter confusion. Then you remember that this is Gintama we're talking about here. 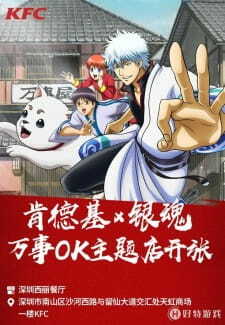 Yes, the most ambitious crossover in anime: Gintama partnering with China KFC. As this will be the best advert for KFC you will ever see, it is only right to give it a 10/10. There's a plentiful amount content to excited about in the main series of Gintama - this is definitely not the best thing to come out of Gintama. Make sure you watch more than 6 episodes of the 300+ episode anime before you reach that conclusion! Nonetheless, enjoy your Gintoki-flavoured ice creams and maybe one day this will happen again. One day. Easily the best thing to come out of Gintama since its only two minutes long and isnt the most inconsistent, unfunny, tonally-inept and repetitive thing you'll watch in your life. Unfortunately the only good thing this short has is the food in the advertisement, as the material that it's based off one of the most overrated and unfunny shows you'll find coming out of anime. Despite everything this is still Gintama, and as a MAL user I am legally obligated to give it a 10/10 with the hopes that yet another Gintama-based show will reach the top ten anime on the site.